Labeled as the Top Grossing Movie in the history of China's box office has intrigued me to watch this movie. 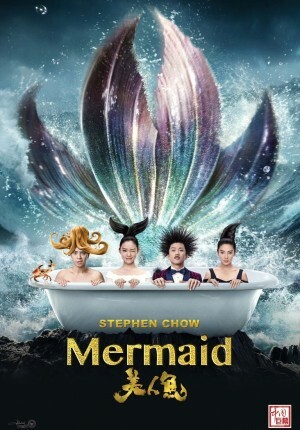 Knowing that it was directed by Stephen Chow whose previous films such as Kungfu Hustle, Shaolin Soccer and various other movies from 1990s and 2000s made me even more excited. I have to admit that I am a fan of Stephen Chow as I can always have a good laugh in most of his movies. So when it finally came to Indonesia, I had made a decision that this is a must watch movie for me. Last night, when my wife (@yennymakanmulu) is having a very rare spare time, we watched this together at 7pm after I left from work. The opening scene shows an old guy who was making a "show" about various weird animals and findings including his ultimate finale, a mermaid. Story later moves to the scene of auction for Green Gulf, a reserve for wildlife such as dolphins and other sea creatures. The property was finally purchased by Liu Xuan (played by Deng Chao) after some serious bidding war competition particularly from Ruo Lan (played by Zhang Yuqi). Apparently Liu Xuan wanted to do reclamation on the green gulf and made a fortune on it by building theme parks etc. Ruo Lan managed to persuade Liu Xuan to become his business partner in this project as she sees a big profit from this. They later on had a party to celebrate the joint partnership, where a girl with very bad make up insisted that she is a fan of Liu Xuan and gave him her name card. Shan (played by newcomer Lin Yun) is actually a mermaid in disguise who works at a chicken stall in a fun fair. Shan was living in a wrecked ship located at the side of the green gulf together with other mermaids and an octopus (played by Show Luo). They were taking refuge there due to the very dangerous sonar equipment placed by Liu Xuan's team which can kill any living thing in the sea trying to return to the green gulf after reclamation. Due to this reason, Octopus has arranged Shan to seduce Liu Xuan, and bring him back to a place where the rest of the remaining mermaids can kill him for revenge. When Shan finally get the chance to kill Liu Xuan in his office, there were lots of hilarious moments where all her efforts fail spectacularly. In fact, later on Shan seem to fall for Liu Xuan. Meanwhile, Ruo Lan still tried to get Liu Xuan's attention and affection. So can the mermaids have their revenge to Liu Xuan? Will Shan be able to choose between the other mermaids and Liu Xuan? Will Ruo Lan have any impact in their relationship? Can all the mermaids be saved? Find them out when you watch it. It's playing in all the cinema chains in Indonesia (to my surprise). My wife and I really enjoyed this movie. There were three scenes that all of us in theater were laughing very hard. It's been long time since we had this much laughter until we had teary eyes. Even after the movie finished, we were still laughing from those various epic scenes. However, aside from all the laughs, the movie actually sends a quite heavy message about not messing with the environment. So I had a great moment watching this film. I can say that Stephen Chow did it again. The only flaws that I can think of is the way the cameos were being "forced" to be inserted in the earlier scene, and the special effects were not 1st class. But overall it is an enjoyable movie. If you have watched Stephen Chow's other films, then you would love this one, even if he is not playing in it.